Salary range €150,000+ depending on experience, plus company car and great company benefits. 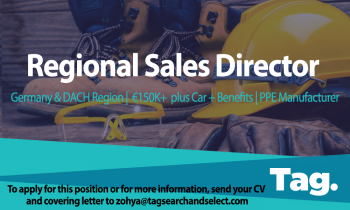 Tag are working in close partnership with a market leading developer and manufacturer of specialised PPE products, whom are looking for a Regional Sales Director to cover Germany and the DACH Region. The company has established itself with its well-known and trusted brands, focusing on delivering high-quality bespoke PPE products with markets across Europe and are continuing to successfully expand into new territories. Grow Sales, build brand awareness and preference with our PPE production partners, leading a team of regional/territory sales managers and agents across the DACH Region to achieve company objectives. Work with a strong sense of urgency. Experienced candidate who can develop, implement and control their team in the DACH region. Specifying our PPE to the product producers in the following many Vertical markets. Currently in the DACH Region there is a turnover of over 15 million, the RSD being hired will have a business plan to grow sales in the region. Strong leadership approach and background, team player, with a dynamic skill set. Experience in effective man management of around 9-10 people. 10 years + experience in Sales and man-management required.